Last weekend I set off for a quick overnight trip to the White Mountains in New Hampshire to catch a glimpse of the famous fall foliage. Adam was busy working, so I recruited my friend Aimee to join me! 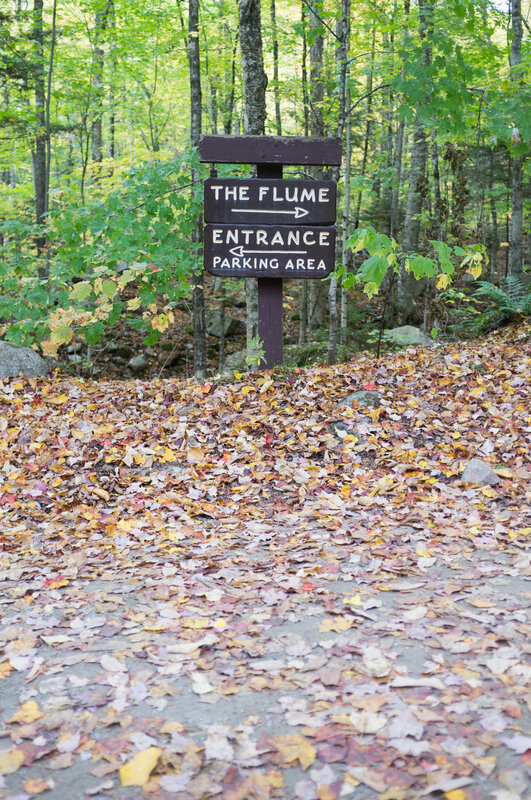 Our first stop: the Flume Gorge. This 2 mile self-guided nature walk through the woods was exactly what we needed after the three-hour drive from Boston. Admission is $16 per person, but well worth it. The scenery is simply awe inspiring and the foliage was unlike anything I'd seen before. the view from the visitor's center at Flume Gorge. After our visit to the Flume we drove to our hotel to check in and grab dinner. We booked a room at the super quaint New England Inn & Lodge. We stayed in the lodge and my favorite part of our stay was the gas fireplace in our room! So cozy on a chilly, autumn evening. We ate dinner onsite at Tuckerman's Tavern. After breakfast we drove the famous Kancamagus Highway. The "Kanc" cuts through the White Mountain National Forest and has the most breathtaking views. Keep your eyes peeled for scenic overlooks where you can pull over for a closer look and grab some photos. There are ample opportunities to pull over at designated overlooks, so get your camera ready. Until next time, dreamy New Hampshire! Where are your favorite places to visit during fall in New England?